DEAN ELGAR and Faf du Plessis continued their batting love affair with St. George’s Park as they both ground out patient innings that put the Castle Lager Proteas well in control after day one of the second Sunfoil Test match. Elgar mad his third Test match century, his second at Port Elizabeth and his highest Test score of 121 (239 balls, 18 fours) while Du Plessis finished the day unbeaten on 99 (228 balls, 12 fours and 2 sixes) as the Proteas closed on 270/2 in the 88 overs that the West Indies were able to bowl in the allotted time. 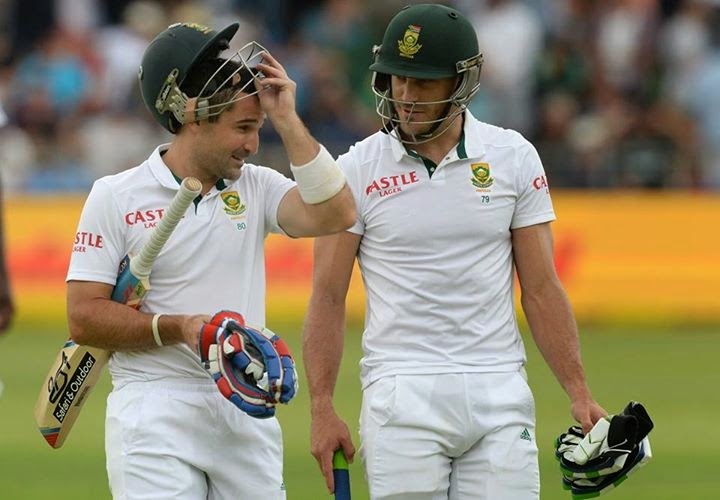 Elgar and Du Plessis have now both made more than 300 runs in the four innings they have had at St. George’s Park. The West Indies won the toss for the second match in a row and again opted to bowl first. It was the decision they had to take after naming a side with five specialist bowlers, including four seamers, leaving themselves a specialist batsman light. They put in a much better and more committed performance with the ball in spite of the close of play total suggesting otherwise. The inclusion of Shannon Gabriel, who bowled at impressive pace, and Jason Holder, who brought the accuracy that had been lacking at SuperSport Park, certainly made a difference. Jerome Taylor and Suleiman Benn, who bowled exactly half of the overs between them, also contributed well while the new cap, Kenroy Peters, broke the ground record second wicket stand of 179 between Du Plessis and Elgar. The Proteas’ total could have been less secure had the West Indies fielders given their bowlers the support they deserved. Du Plessis was dropped in the slips cordon on 8 and again on 26 while Elgar should have been stumped on 48. Benn, in fact, could have dismissed the pair in the same over and then had the mortification of seeing Elgar pump him back over his head for four to reach his half-century. The Proteas will no doubt also give some thought to their running between the wickets as there were no fewer than four run out opportunities on which the West Indies were not able to capitalise. It was a day that required patience from both the batsmen and the bowlers. It took both Elgar and Du Plessis until the final session to come to terms with the pace of the pitch which did not encourage attacking strokeplay. Nevertheless the Proteas managed to maintain a run rate of three to the over throughout the day, scoring 68/1 in the first session in 25 overs, 89 in the second without loss in 30 overs and 113/1 in the final session off 33 overs. Du Plessis and Hashim Amla are now poised to build the Proteas total into a near invincible position with plenty of batting to follow. The conditions offered the bowlers neither swing nor seam but Taylor has already given indication that uneven bounce is going to become an increasing factor in the match, particularly for left-handers. This is where Elgar did particularly well. Apart from his undoubted talent he has loads of courage and was not unsettled either by a nasty blow to the inside of his elbow or one that clipped his helmet. As expected, the Proteas named Temba Bavuma as the 85th player to be capped for the Proteas in the five-day format while local conditions caused Imran Tahir to be preferred to Kyle Abbott.